In this tutorial I will show you how easily you can create feature to show selected color name (on product page that has color attribute). As you already know PrestaShop 1.7 has a feature to create "combinations". Combinations are product variants (product variant is based on product attributes: different sizes of shoes, different colors of t-shirts etc). Each product variant can have own unique values of attributes like size, material, color etc. 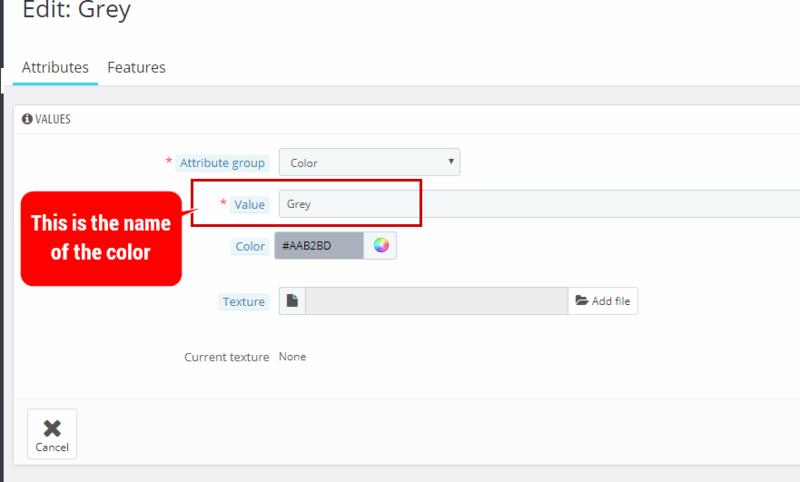 In this guide we are focused on color attribute - selection of color attribute does not display the color name. This guide shows how to change it and display selected color attribute. Tutorial is based on "classic" template but it is applicable for all themes that are based on "classic" theme structure. That's all, after save of the files you should see the changes on product pages. If you do not see any difference it might be required to clear your browser cache because it remembers old .css and .js file contents. Simply saying: if after modification you do not see the difference - clear browser cache or refresh product page with key combination: ctrl+f5 (hard refresh with cache clear). How to define color name?